"Bare Island has the greatest number of dives of any location in Sydney"
The Solitary Islands run from Coffs Harbour to Sandon Point on the North Coast of New South Wales. This area has some of the best dives in Australia, if not anywhere in the World. Most dives are done off Coffs Harbour at South Solitary Island and North Solitary Island off Wooli. One of the excellent dive sites that is not dived all that often is Wrights Reef. This site was discovered by local commercial fisher, Darcy Wright, and shown to Chris Connell from Dive Quest. This site is located about two kilometres east of North Solitary Island which is about seven kilometres from Arrawarra Headland which is where Dive Quest launches their boat. It takes about 20 minutes to get here once the boat has been launched. This dive site consists of huge rock and a couple of smaller rocks that sit on sand at almost 30 metres. The main rock is longer north-south than east-west (perhaps 125 metres long and 40 metres wide). The two smaller rocks are perhaps 30 metres by 30 metres. The shallowest bit comes up to about 15 metres. The main rock is deeper, perhaps 22 metres deep at the shallowest. The main section of reef has a tunnel that runs roughly east-west. The eastern side of the tunnel is on the sand and the western side is on the reef at about 27 metres or so. There are normally two moorings at this location. One is on the sand off the eastern side of the tunnel and the other is on the northernmost section. Note that the moorings at this site have changed locations over the years so they might not be at the same spot now. At one time one was on the reef near the western exit of the tunnel. The normal dive here would use the mooring off the tunnel. From the bottom of the mooring (30 metres) here I would swim towards the tunnel, looking out for grey nurse sharks. The tunnel is only about 15 metres and it will only take about one minute to travel through it, even examining the sides and roof of the tunnel. I have seen five firefish inside the tunnel as well as some crayfish. Once out of the tunnel, explore the reef. You will probably see wobbegongs, anemones and clownfish, large schools of bream, snapper and other species. I have seen a Queensland groper here as well as estuary cod. I even saw a decorator crab one time. 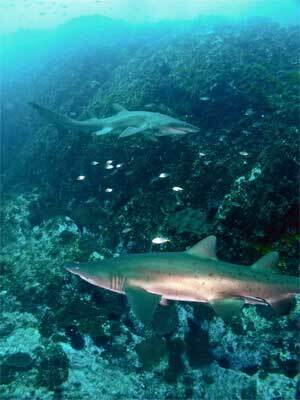 There is always the chance of seeing grey nurse sharks here. As this is a fairly square profile dive, you will not be able to spend much more than 20 minutes on the bottom before running into decompression. This is one of the better dives you will ever do. However, only for experienced divers due to the depth and the possibility of currents.